My bike is a 2003 w/ 25.3K miles, blue. 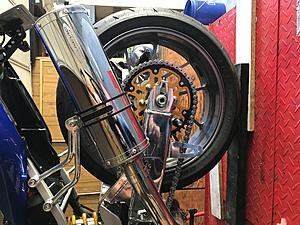 It has a Moriwaki swing-arm, GaleSpeed forged aluminum wheels, Progressive fork springs (.95KG), Daughtry reworked shock, lightened flywheel (to Mori specs), EM R/R kit, manual CCTs, LifePO4 battery, recently tuned carbs (any related component that was suspect replaced), Givi V46 removable top-box with color-matching cover, adjustable AGC levers, steel brake lines, 954RR front calipers, Coerce fork brace ,Scott steering damper, Two Brothers low exhausts, etc. All the upgrades are new, or near new. My question is, how much do you figure I can increase my net, selling the bike as is, versus removing most/all the 'goodies' and selling them separately? Thanks for your help. And don't get me wrong. I LOVE my bike. But all things considered, I have other priorities now. Last edited by AlanS; 09-05-2018 at 06:33 PM. i dont mean to sound like a vulture but have you any pictures of the swingarm?? turbotimm, check out the classifieds here. I recall seeing a Yoshi exhaust. As for mine, I'll keep you in mind, but unlikely to part the bike out. As for the prices you reference, those are in the ballpark I'm sure. As noted often on this site and elsewhere, these bikes don't bring a premium. Vultures are welcome. As long as they bring cash, fabiostar. LOL. I posted a pic, hopefully you can see the swingarm well enough. I don't have any pictures dedicated to it. Last edited by AlanS; 09-06-2018 at 05:28 PM. Myself personally I would return it about as close to stock as I could and sell the bits separately. I would at least sell stuff like the wheels and the swingarm separate. I'm sure they're worth a fair amount on their own and unfortunately add about zero value to the bike as a whole when you try and sell it. They will probably make it a quicker sale to the right person (like someone on here who knows, wants and appreciates what they're getting) but you'll make out better selling the bike as close to stock as you can. That'll also allow you to drop the price and sell it quicker. I've probably owned about 15 of these things since 1999 and parted out 3 or 4 so take it for what it's worth. But I also buy and sell a fair amount of stuff here and on ebay and craigslist so it's not a big deal for me. A lot of people don't want to be bothered doing that. Another thing I've noticed lately is that the audience for expensive aftermarket stuff for these bikes is starting to dwindle a bit, so you may need to be a little more patient with something expensive like those wheels. Last edited by captainchaos; 09-06-2018 at 05:40 PM. captainchaos, your points are well-taken. I know you know the market. Contrary to my original thought, I figure I will end up restoring the bike to near-stock, then selling the 'tasty' bits as you suggest. I've already spoken to my friend, Mike, about doing the swaps for me. Even after I compensate him, I'll still come out ahead. It's too bad. It handles pretty well as it sits. But unless you find another SH aficionado that wants a complete bike and appreciates the upgrades, it might as well be stock for all the upgrades are worth to the asking-price. If you were selling the Moriwaki swing-arm, what would you ask for it? Same question regarding the Gale Speed forged alum wheels? I'm not in a big hurry on anything, I just need/want to sell the bike before I move so as not to have to drag it around. Last edited by AlanS; 09-07-2018 at 04:29 PM. Exactly. Myself for instance, would be willing to pay more for a sweet bike like yours with a bunch of nice upgrades like that. "Oh, I forgot you like 'those things' " I was once told by a friend who owned a local bike shop. But unfortunately the average Craigslist kid may like a loud exhaust but otherwise has no idea about most of the rest of that stuff. Regarding the wheels... I have a pair of Marchesinis I'll be selling soon, but those are off an RC51 (I had SP2 forks and swingarm on one of my bikes) and there always seems to be a demand for that stuff. I bought them used and will probably not take less than a grand for the bare wheels. They're an older 5 spoke style and I'm not certain how much they were new (probably more like 2k). What were the Galespeeds, at least $1500? I mean by the looks of your bike I'm sure they're perfect/near perfect, so someone who wants them would probably also pay a grand or so for them. But you might have to be patient for someone who wants to bling out their Superhawk and throw that kind of money at it. Might also be useful to cross reference any other bike those wheels will fit if you want to put them up for a larger audience on a place like Fleabay. Alan, IF you ever decide to part it out I'd be really interest in the Mori swingarm for a decent price. god thats a nice swingarm.. Funny you should mention putting everything back to stock...I did that when I sold Triumph Speed Triple. People are just looking for the best deal. They would not appreciate the work and money that was put in that excellent machine. Superhawk Fan Switch UPGRADE - Thoughts? lots of random mods and other thoughts, need opinions. A brake ? Your thoughts.